There are so many animals on this planet which are really cute and nice, Seal is one of those. Charlie Bird meets seals while travelling through Antarctica. He films those and spends some time with seals. Charlie has shared this video with us on internet. He is an Irish journalist and broadcaster. He was born on 9 September 1949. He shares his experience with seals in this video. You can see so many seals lying together. Charlie tells that these are elephant seals. The one he is looking at in the beginning is a pub of elephant seal. Charlie is lying down onto the ground holding a camera in his hand and it seems like the seal lying just next to him wants his camera. Then seal gets busy in scratching its head. 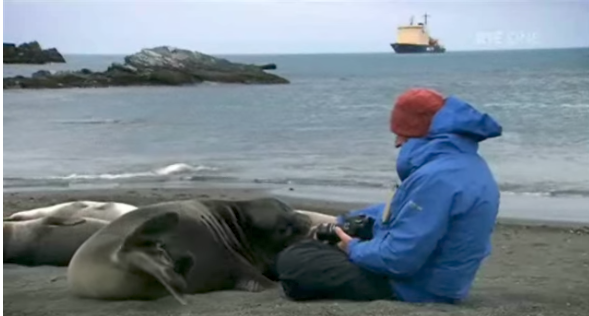 Charlie tells that it is an amazing experience for him to lay down along with seals. It looks very cute how a seal moves. Two seals lay together on him and you can hear him struggling to breath in his voice. Those things must be heavy. I wonder how much a baby seal weights. Charlie tells that he has done so many difficult things in his life as a journalist but this must be one of the remarkable things he has ever done in his life. A seal again scratches its head while laying on him. Charlie keeps on smiling and enjoying this moment with seals. The seal is moving on all over his lower part of body. I really love charlie’s joy after he is hugged by a seal. This is the most heartwarming moment ever captured on camera and one of the cutest things i have ever seen on internet. The way the seal moves over him, i wonder if the seal just saw him as one of its pups. There are many species of seals and elephant seals are larger among all others. There are two species in elephant seals, northern elephant seal and southern elephant seal. The northern elephant seal is somewhat smaller than its southern relative. Northern female elephant seals have lived to 22 years. Elephant seals breed annually and can give birth starting at the age of three or four. Thanks for watching this amazing video and i hope you liked these elephant seals.